Such dark thoughts pervaded the Pernese conscious for hundreds of turns. Two hundred turns after the dragons vanish the unthinkable happens as Thread begins to fall. Whers and firelizards struggled to protect the world just as the dragons had done before them, but at the end of the fifty turn long Pass Pern’s new protectors had nearly wiped themselves out with the effort. Another two hundred turns passed and their numbers had yet to recover. Just as many believe their world will fall into darkness once more a light of hope shines upon them. As the Lord Holders prepare to announce the grim news, a great golden beast appears in the sky flanked by six hundred dragons ready to protect a world that thought them gone. Both hope and fear fill the people of Pern, but before anyone can decide which they they dared trust, the Queen vanished, leaving behind fifty dragons and their riders as well as a precious gift. A clutch of twenty-nine eggs donated to the newly formed Aterrima Weyr, one holding the coveted golden Queen. The search for Candidates begins, whether the young men and women of Pern are willing or not. A clutch of 29 eggs, including one golden egg, currently on the sands. Non canon colors. 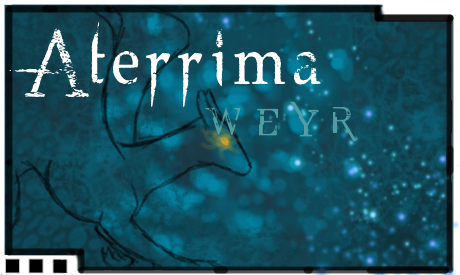 New colors will be introduced with Aterrima's first hatching. Aterrima's second Moonstone clutch is hardening on the sands! Aterrima's first Beryl clutch is not far behind.